The Park Crescent Area comprises the southern most parts of Crown Portions 113, 114, 115, 116 and 117, which were sold at the land sales of June 1840. William Hoddle surveyed these 'small sections', with narrow frontages to the Yarra River, with each portion being approximately 93 acres. Early development in the area derived from the sale of some of this land to C H James and Percy Dobson, as the Fulham Grange orchards and associated jam and preserves factory. It was subdivided into one acre lots and sold as the Fulham Grange Estate. James and Dobson's adjoining subdivision, the St James Park Estate, was created from Vidal's Crown Portion 114 in 1883. Land changed hands in the 1880s but further development of a large number of the sites did not get underway until the early years of the 20th century. However some houses were built in the Victorian era such as Bella Vista, built at 23 Alphington St for Katherine and James Marriott in 1887 (demolished) and the towered Italianate house, The Nook (1892-3) built at 25 Alphington St for William Brewer. Brewer also built the large and fanciful American Queen Anne style mansion, Andembach, in Park Crescent (now a flat site) in 1894. Key Edwardian-era houses include one for local councillor and Collingwood Mayor, Arthur Collins (18 Alphington St, 1913), and another for the architect Horace John MacKennal, 46 Park Crescent (1903). Artists and designers, such as Marriott and MacKennal, had frequented this part of Alphington, Ivanhoe and Heidelberg in the Victorian and Edwardian-eras, providing a special cultural character to this part of the City. The house at 41 Park Crescent is also a well-preserved Edwardian-era house with pressed metal linings throughout, rare remnant picket fence and gates, old elevated tennis court at the river side and a mature garden (87). The area continued to develop into the inter-war period, with a number of Californian Bungalow style houses built immediately after the First War including numbers 40, 42, 43, 48 49, 51, 54 Park Crescent and 29 Alphington Street (another Marriott house), 31, and 33 Alphington Street , with 59 Park Crescent built in a later inter-war style. Many of these houses have related garden settings, some remnant wire front fences, and mature trees. The mature plane tree avenue along Alphington St was also created in the interwar period, as part of a new enthusiasm in the former Shire of Heidelberg for street tree planting, post WW1 (88). The main development period of the Park Crescent Heritage Overlay Area is that of pre World War Two, with key houses from the Edwardian and Victorian-eras, with a contribution from individually significant places of all eras.
. 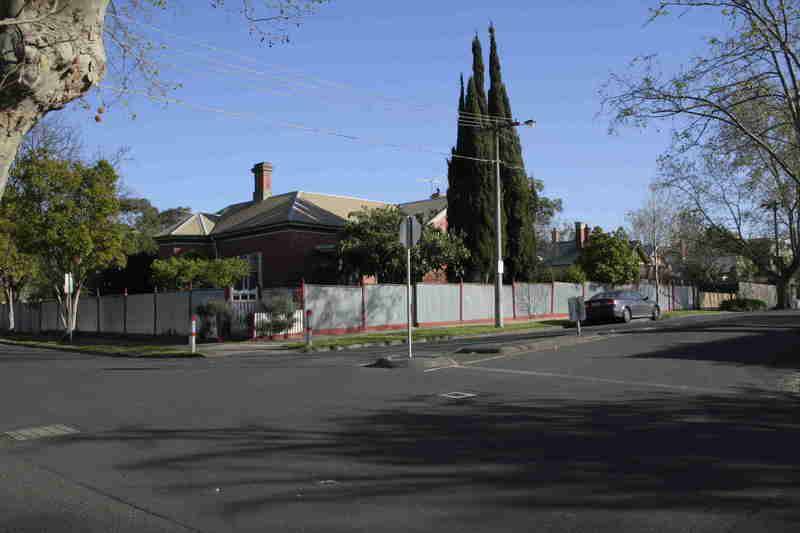 Originally had timber picket or wire front fences (inter-war) to around 1m height, and paling side and rear fences.
. urban infrastructure such as mature street trees (planes), bluestone kerb and channel. The Park Crescent Heritage Overlay Area is significant.
. as an aesthetically significant and well preserved group of largely 1920s and Edwardian villas, some of which are individually significant, some picturesque in from, many on large sloping blocks, and many set within extensive gardens, as an uncommon group in the City.